مبینی دهکردی, بهنام, شایق بروجنی, بهروز, سائری, محمدرضا. (1395). ارزیابی پوشش‌های کامپوزیتی نانو ساختار Al2O3-TiO2 سنتز شده از طریق فرآیند الکتروفورتیک. نشریه علوم و مهندسی سطح, 12(30), 33-43. بهنام مبینی دهکردی; بهروز شایق بروجنی; محمدرضا سائری. "ارزیابی پوشش‌های کامپوزیتی نانو ساختار Al2O3-TiO2 سنتز شده از طریق فرآیند الکتروفورتیک". 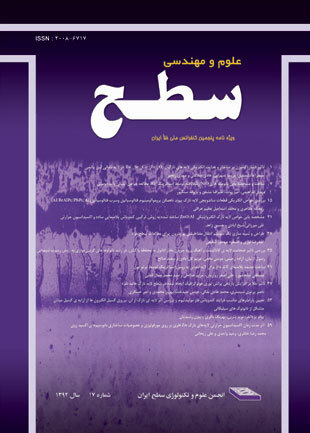 نشریه علوم و مهندسی سطح, 12, 30, 1395, 33-43. مبینی دهکردی, بهنام, شایق بروجنی, بهروز, سائری, محمدرضا. (1395). 'ارزیابی پوشش‌های کامپوزیتی نانو ساختار Al2O3-TiO2 سنتز شده از طریق فرآیند الکتروفورتیک', نشریه علوم و مهندسی سطح, 12(30), pp. 33-43. مبینی دهکردی, بهنام, شایق بروجنی, بهروز, سائری, محمدرضا. ارزیابی پوشش‌های کامپوزیتی نانو ساختار Al2O3-TiO2 سنتز شده از طریق فرآیند الکتروفورتیک. نشریه علوم و مهندسی سطح, 1395; 12(30): 33-43. در تحقیق حاضر، نانوذرات آلومینا- تیتانیا به صورت لایه نازک در محیط‌ های الکلی مختلف از جمله الکترولیت‌ های اتانولی، بوتانولی و ایزوپروپانولی بر روی زیرلایه‌ های فولادی با استفاده از فرآیند الکتروفورتیک (Electrophoretic) پوشش داده شدند. عملیات پوشش‌ دهی در ولتاژهای مختلفی انجام شد، همچنین از روش کرونوآمپرومتری برای بررسی مکانیزم جوانه‌ زنی و کیفیت سطحی پوشش‌ ها استفاده گردید. از میکروسکوپ نوری به منظور اندازه گیری ضخامت و چسبندگی پوشش‌ها به زیرلایه استفاده شد. در آزمون اندازه گیری وزن پوشش نشان داده شد که وزن پوشش ایجاد شده با افزایش ولتاژپوشش ‌دهی افزایش می‌یابد. با اعمال ولتاژهای کم، بیشترین میزان پوشش در حضور سوسپانسیون بوتانولی ایجاد شد در حالی‌ که با افزایش ولتاژ، پوشش‌ های سنتز شده در حضور سوسپانسیون اتانولی از وزن بیشتری برخوردار شدند. در نتایج اندازه ‌گیری وزن پوشش ‌ها و مشاهده کیفی آن‌ها نشان داده شد که تغییرات وزن پوشش با ولتاژ (شدت میدان الکتریکی) و زمان از رابطه هاماکر پیروی می‌کنند. .دولتی، ابوالقاسم.، مطالعه ‌سینتیک ‌رسوب الکتروشیمیایی آلیاژ کبالت- نیکل نانوکریستالی به صورت لایه نازک در محلول سولفاتی، مجله تحقیقات مواد نانو کامپوزیتی، 1388،3:1، 142- 135. 2 .S.D. Leith, S. Ramli, D.T. Schwartz, Journal of the Electrochemical Society, 146, )1999(, 1431. 3.S.D. Leith, W. Wang, D.T. Schwartz, Journal of the Electrochemical Society, 145, )1999(, 2827. 4.L. Besra and M. Liu, A Review on Fundamental andApplications of Electrophoretic Deposition, Prog.Mater. Sci., 52  1–61, (2007). 5. T. Uchikoshi, K. Ozawa, B.D. Hatton and Y. Sakka,Electrophoretic Deposition of Al2O3 Suspension in aMagnetic Field, J. Mater. Res., 16  321–4 (2001). 6. A. M. Popa, J. Vleugels, J. Vermant, and O. Van der Biest, Influence of Ammonium Salt of Poly-MethacrylicAcid and Butylamine Addition on the Viscosity andElectrophoretic Deposition Behavior of Ethanol-BasedPowder Suspensions, Colloids Surf. A: Physicochem.Eng. Aspects, 267 [1–3] 74–8, (2005). Electrophoretic Shaping of Sub-Micron Alumina inEthanol, Ceram. Int., 35  1855–61 (2009). 8. X. F. Xiao and R. F. Liu, Effect of Suspension Stabilityon Electrophoretic Deposition of HydroxyapatiteCoatings, Mater. Lett., 60 [21–22] 2627–32 (2006). Electrophoresis, Trans. Faraday Soc., 36, 279–87, (1940). 10. Morteza Farrokhi-Rad, Mohammad Ghorbani. Electrophoretic Deposition of Titania Nanoparticles in Different Alcohols: Kinetics of Deposition, J. Am Ceram.Soc, (2011), 94  2354–2361. 11. L. Besra, M. Liu, A Review on Fundamentals and Applications of Electrophoretic Deposition (EPD), Prog.Mater., Sci, (2007), 52, 1-61. 12. P. Sarkar, P. S. Nicholson, Electrophoretic Deposition (EPD): Mechanisms, Kinetics, and Application to Ceramics, J. Am. Ceram. Soc., (1996),79,1987-2002. 13. X. Wu, P. Su, Z. Jiang, S. Meng, Influences of current density on tribological characteristics of ceramic coatings on ZK60 Mg alloy by plasma electrolyticoxidation, ACS App. Mate. Interfaces 2 (2010) 808–812. 14. H. Dong, T. Bell, Enhanced wear resistance of titanium surfaces by a new thermal oxidation treatment, Wear 238 (2000) 131–137. 15. D.S.R. Krishna, Y.L. Brama, Y. Sun, Thick rutile layer on titanium for tribological applications, Tribol. Int. 40 (2007) 329–334. 16. A.L. Yerokhin, X. Nie, A. Leyland, A. Matthews, Characterisation of oxide filmsproduced by plasma electrolytic oxidation of a Ti–6Al–4V alloy, Surf.Coat.Technol. 130 (2000) 195–206. 17. M. Montazeri, C. Dehghanian, M. Shokouhfar, A. Baradaran, Investigation of the voltage and time effects on the formation of hydroxyl apatite-containing titania prepared by plasma electrolytic oxidation on Ti–6Al–4V alloy and its corrosion behavior, Appl. Surf. Sci. 257 (2011) 7268–7275. 18. A. Ghasemi, V.S. Raja, C. Blawert, W. Dietzel, K.U. Kainer, Study of thestructure and corrosion behavior of PEO coatings on AM50 magnesium alloy by Electrochemical impedance spectroscopy, Surf. Coat.Technol. 202 (2008) 3513–3518. 19. L. Wen, Y.M. Wang, Y. Liu, Y. Zhou, L.X. Guo, J.H. Ouyang, D.C. Jia, EIS study of a self-repairing micro arc oxidation coating, Corros. Sci. 53 (2011) 618–623. 20. M. Herrmann, Corrosion of silicon nitride materials in aqueous solutions, J.Am. Ceram. Soc. 96 (2013) 3009–3022. 21. H. Niazi, S. Yari, F. Golestani-Fard, M. Shahmiri, W. Wang, A. Alfantazi and R. Bayati, How depositionParameters affect corrosion behavior of TiO2-Al2O3nanocomposite coatings, Applied Surface Science.353 (2015) 1242–1252. 22. X.Q. Cao, R. Vassen, D. Stoever, Ceramic materials for thermal barrier coatings, J. Eur.Ceram. Soc. 24 (2004) 1–10. 23. F. Samanipour, M.R. Bayati, F. Golestani-Fard, H.R. Zargar, A.R. Mirhabibi, V.Shoaei-Rad, S. Abassi, Innovative fabrication of ZrO2–HAp–TiO2 nano/micro-structured composites through MAO/EPD combined method, Mater. Lett. 65 (2011) 926–928. 24. F. Samanipour, M.R. Bayati, F. Golestani-Fard, H.R. Zargar, T. Troczynski, A.R.Mirhabibi, An innovative technique to simply fabricate ZrO2–HA–Tinanostructured layers, Colloids Surf. B 86 (2011) 14–20. 25. F. Samanipour, M.R. Bayati, H.R. Zargar, F. Golestani- Fard, T. Troczynski, M.Taheri, Electrophoretic Enhanced micro arc oxidation of ZrO2–HAp–TiO2 nanostructured porous layers, J. Alloys Comp. 509 (2011) 9351–9355. 26. A. Seyfoori, S. Mirdamadi, A. Khavandi, Z.S. Raufi, Biodegradation behavior of micro-arc oxidized AZ31 magnesium alloys formed in two different electrolytes, Appl. Surf. Sci. 261 (2012) 92–100. 27. M.R. Bayati, F. Golestani-Fard, A.Z. Moshfegh, How photocatalytic activity of the MAO-grown TiO2 nano/micro-porous films is influenced by growth parameters, Appl.Surf.Sci. 256 (2010) 4253–4259. 28. M.R. Bayati, F. Golestani-Fard, A.Z. Moshfegh, Visible photodecomposition of methylene blue over micro arc oxidized WO3–loaded TiO2 nano-porous layers, Appl. Catal. A. 382 (2010) 322–331. 29. M.R. Bayati, F. Golestani-Fard, A.Z. Moshfegh, R. Molaei, A photocatalytic approach in micro arc oxidation ofWO3–TiO2 nano porous semiconductors under pulse current, Mater. Chem. Phys. 128 (2011) 427–432. 30. M.R. Bayati, A.Z. Moshfegh, F. Golestani-Fard, Effect of electrical parameters on morphology, chemical composition and photoactivity of the nano-porous titania layers synthesized by pulse-microarc oxidation, Electrochim. Acta, 55(2010) 2760–2766. 31. M.R. Bayati, A.Z. Moshfegh, F. Golestani-Fard, In situ growth of vanadia–titania nano/micro-porous layers with enhanced photocatalytic performance by micro-arc oxidation, Electrochim. Acta, 55 (2010) 3093–3102. 32. M.R. Bayati, H.R. Zargar, A. Talimian, A. Ziaee, R. Molaei, Characterization of Al2O3–TiO2 nano porous Solar absorbers derived via MAO/sol-gel hybrid process, Surf.Coat. Technol. 205 (2010) 2483–2489. 33. Tomkiewicz, M. and G. Dagan, and J. Phys. Chem. 97 (1993) 12651. 34. Wei, Z. B. and Yan, W. and Zhang, H. and Ren, T. and Xin, Q. and Li, Z. Appl. Catal. A: Gen. 167 (1998) 39. 35. A. R. Gardeshzadeh, B. Raissi, E. Marzbanrad, Electrophoretic Deposition of SnO2 Nanoparticles Using Low Frequency AC Electric Fields, Mater. Lett, (2008) ,62,1697-(1699). 36. A. R. Gardeshzadeh, B. Raissi, E. Marzbanrad, Preparation of Si Powder Thick Films by Low Frequenc Alternating Electrophoretic Deposition, J . Mater. Lett , 43, (2008), 2507-2508. 37. H. Negishi, K. Yamaji, N. Sakal, T. Horita, H. Yanaglshlta,H.Yokokawa, ElectrophoreticDeposition of YSZ Powders for Solid Oxide Fuel Cells, Journal of Materials Science, (2004),39,833-838. 38. S. N. Heavens, Electrophoretic Deposition as A Processing Route for Ceramics, Advanced Ceramic Processing and Technology, Vol. 1, Noyes Pub. NJ, USA, (1990), 255-283. 39. A. V. Delgado, F. González-Caballero, R. J. Hunter, L. K.Koopal, J. Lyklema," Measurement and Interpretation of Electrokinetic Phenomena, J. Colloid Interf. Sci, (2007),309,194-224.